While I started this many weeks back, I finally completed it last week. It is done using an indirect painting method in oil which is a great way to paint if you don't mind working over a longer period of time. The nice thing with indirect painting is that you can really work towards a more refined finish and as the layers are painted thinly, you can usually work every day without ever having to wait for paint to dry as you move around the canvas. I really love how Jellybean's muzzle turned out, it basically fell off my brush. She was so much fun to paint! 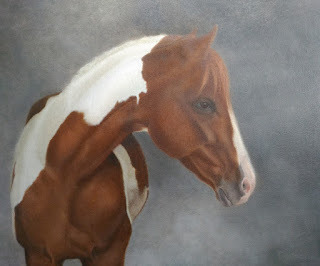 I am really looking forward to painting more horses. Horses are all that I drew for the first few years when I was young and just learning to draw. It is a great excuse to also spend more time with horses which I really miss. The other way I like to paint with oils is using the alla prima method which is just a painting completed in one sitting....although I usually like to come back the next day and fiddle just a bit. It is great to be able to do both at it provides you with the best of both. 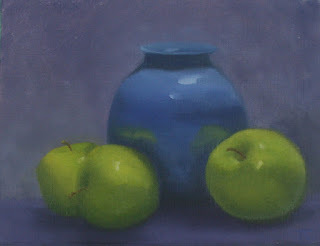 The Blue Vase & Apples is a recent alla prima painting I completed. If you are interested in learning to paint alla prima, join me Monday nights at the Port Moody Arts Centre. You can register online at Port Moody Arts Center Online Link or call 604-931-2008 to register.